It seems odd for so many of us to feel so oddly connected to Robin Williams, and yet it isn’t odd. It is precisely right. We feel connected to Robin Williams because he made us laugh. He made us feel. And he made us have hope for tomorrow. As such, his is the voice of much of our lives’ soundtrack. When we “dial back” the years of our lives, so many of the sound bites are of his voice, of his laughter. Our soundtracks feature him, but they also combine his and our laughter until it is difficult to hear where his voice left off and ours began. He made us laugh and then we laughed, which made him laugh too. For this, we loved him. We loved how he made us feel alive and happy and hopeful. For many, it goes back to the Mork and Mindy years. Folks my age remember a time when laughter came easily – often with siblings or parents or friends, sitting on floral or plaid couches and laughing at Mork’s weekly serving of humor in our lives. I never watched Mork and Mindy; it must have been on at the same time as something my father liked to watch. But I saw the commercials; I knew of the suspenders. I knew of his infamous sitting on the chair upside-down. Even without watching the show, I knew Robin Williams was a funny, funny man. However, my personal life soundtrack didn’t include Robin Williams until much later. And, surprisingly, it wasn’t his expertise as a comic that made me love him. It was his acting and his improv that sealed that deal. As I wrote here last year, I loved driving to San Francisco with the soundtrack of the movie Good Morning, Vietnam cranked as loud as my after-market Motorola cassette tape player would go. Those trips, my first foray into adulthood and independence, have Robin Williams’ voice all over them. He may have been acting as Adrian Cronauer, and may have been making jokes and setting up for the next song in a movie, but for me, he was encouraging me right along with those soldiers. Like the character he played, Robin Williams made me hope I could grow up and get out of where I was right then. Film after film, Robin was part of my life as I grew from teen to adult. Some of his movies were for the adult in me (hello Birdcage!) and some were for the parent in me. But that voice of his, and his ability to make me smile and laugh, were constant. I realized on Monday how much I had come to count on him being there. And I have a pretty good idea that my friends feel pretty much the same way. But it isn’t only because Robin Williams did so many films during my life that I am so sad that the world has lost its only Robin Williams. I am so sad because I understand bits of him too well. I’ve always recognized the same manic demon in myself that Robin Williams utilized so brilliantly to become who he was – a brilliant comic. And while I could never be even a smidgeon as funny of a comedian as Robin Williams was, I know how tempting it is to turn on the funny and become the funny person. I also know how hard it is to always be funny, even when you don’t feel very funny. For folks like me, folks who do stand-up or feel most comfortable being the “life of the party” instead of hugging the wall nearest the punch bowl, there is magic in the energy we get from being funny. It is thrilling and energizing and seductive as hell. We funny types, we are funny because it helps fill the void and once we learn how to make folks laugh, we will do whatever it takes to do it again. I’m not sure what caused Robin’s void, but I know he had one. He was too funny and too evocative of an actor to not. He was too bright to not also have a terrible darkness looking at him from the void. For myself, I have moments where I’ll do anything to keep that void filled with jokes and funny stories, keep folks near my side where their laughter keeps the darkness at bay. But the trouble is, the joke always reaches its punch line. And then, I remember the darkness is still there. And that is why my heart is so heavy this week. While I always figured Robin and I had lots in common, it is so sad to know that my other soundtrack, the one I don’t talk about in my “real” life, is probably a lot like Robin’s was. Photo by Jodie Andrefski, used by permission. I’m talking about the soundtrack that depression plays in your head. It starts soft and gets louder and louder until it’s all you can hear. It gets so loud that it drowns out the normal sounds and the loud sounds. Mostly it drowns out the hopeful sounds. Depression drowns out hope. I am so happy that most people in my life don’t understand what depression is like to live with, day in and day out. They understand being sad or unhappy for a short period, or even the depression caused by losing a loved one. But they don’t understand that deep, severe depression is different. It’s hard to blame them seeing as how we use the term “depression” to describe an entire spectrum of mental health. Depression is like a weight you cannot escape. Even if you can set it down, it is chained to you and you will drag it along behind until you pick it up again. For me, it is the immense weight of rage and pain and sorrow. And it’s the rage that’s really hard to carry. Being deeply sad makes me no fun to be around, but that’s the safe coating to my depression. Underneath my sadness is a rage that eventually breaks out. The guilt of that rage is a heavy, heavy thing indeed. Because even though I struggle to keep my depression from affecting my family, it always does. Rage doesn’t stay quiet if it can help it. The other thing about severe depression is that it isn’t like catching a cold where one day you are fine and the next you feel that funny tickle in your throat or start sneezing. Instead, severe depression is more like gaining weight over the holidays – it creeps up on you until your waistband is too tight to breathe. Again. When this happens to me, I don’t notice it at first. One day I’m just sad and it isn’t a big deal, it’s just normal like everything else that happens in my day. But once it starts, it builds whether I notice it or not. Then one day I’m really, really tired, a bone-deep tiredness that no amount of sleep helps. And I can’t breathe. My lungs may be working, but it’s like I can never catch my breath. And the voices, the ones that have always been in my head, but for the most part I can shut down or shut out or at least ignore, the voices start saying all kinds of things. Monday’s news reminds us all just how dangerous depression is. It’s dangerous because it doesn’t make sense to those who don’t have it and it is dangerous because it is a sneaky beast. And it’s the sort of sneaky beast that requires constant vigilance and a full arsenal to battle against. But I have to hold onto hope that losing Robin Williams to suicide has opened enough dialogues that we won’t stop talking about depression this time. I have to hold onto hope that we will find a way to change how we treat depression and depressed people. And I have to hope that more of us with depression will reach out to the people we know when we are spiraling out of control. If we don’t reach out, they have a hard time grabbing onto us. It is so damn hard to reach out, but I have to hope that my family and friends will help me reach out and hold on until things get better. 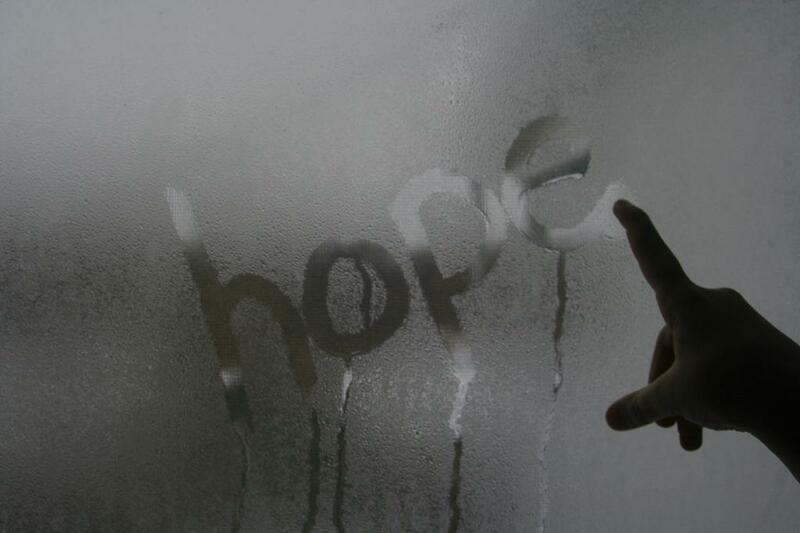 It’s hard to hold onto hope. But we must, or depression will win again. Robin Williams, you were a brilliant, brilliant light. I’ll miss seeing you shine here, but I know your star-shine is still out there…another star in the great big galaxy. Thank you for giving voice to so much of my life’s soundtrack; and thank you for the reminder to battle as long as I can, with everything I can. This entry was posted in Front Page, Life, living with depression and tagged depression, holding onto hope, hope, Jodie Andrefski, Robin Williams, stand-up comedian, suicide by kristina. Bookmark the permalink. What a big strong post. Thanks Kristina, spot – on, as usual.